Pasta -- Cook pasta until al dente or per directions on pasta box. Set cooked pasta aside until step 3 below. Oil, Shrimp -- Spoon enough oil from top of pesto to fill a tablespoon and heat in a large pan over medium-high for 1-2 minutes. Add shrimp and sear until each side is pink, 1 minute per side. Remove shrimp from pan and set aside. 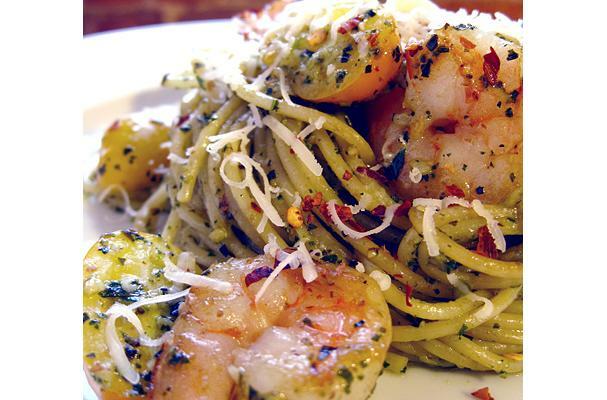 Garlic, Tomatoes, Shrimp, Pasta, Parsley, Chili flakes -- Add garlic and cook until fragrant, 20-30 seconds. Add tomatoes and cook for 1 minute. Add pesto and cook for another 1-2 minutes. Add shrimp and pasta to pan. Toss to incorporate all ingredients. Turn off heat. Add parsley, chili flakes, and salt and pepper to taste. Toss well. Final Steps -- Right before serving add fresh grated Parmesan cheese. Enjoy!